Displayed in order by builder's name if available. If unknown, in order by owner of the engine depicted. This particular engine is believed by this site author to have been built between 1884 - 87 for a 6 mile, 5 foot gauge "pole" road located in Wilson Station, (Escambia County) Alabama. The railroad was known locally as the "Perdido Pole Road" and thought to be owned and operated by Wallace, Sandford & Co. 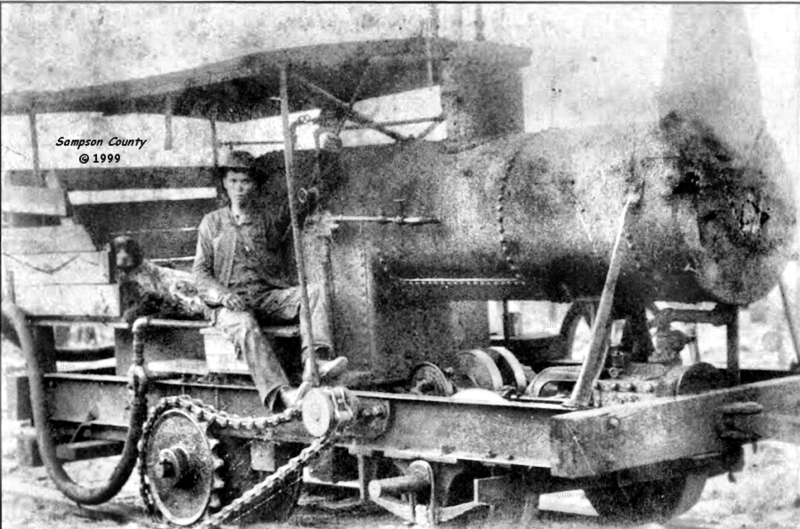 This engine is not believed to have belonged to the Perdido Lumber Company of Baldwin County, Alabama, as they were not known to have operated a "pole" railroad. This was the first pole-road locomotive built by A&P. The engine was named "Hercules" by Sowell who received it new in October, 1884. Source: Logging Railroads of Alabama. The locomotive utilized a "chain" and sprocket gear system similar to that used on bicycles. This differed from the drive shaft system utilized by the most of the other geared engines on this site. Water for steam was carried in a saddle tank above the boiler. Concave (double flanged) wheels were utilized to straddle the poles of the "pole" railroad which these engines were designed to run on. Pole railroads were basically tree logs (with limbs removed) laid end to end for the entire distance of the railroad. The company named the locomotive the "Steam Missionary". One was built in 1896 for an unnamed logging company in Nicaragua. The wheels on the locomotive could be replaced to allow operation on iron rails, wood poles, or even a standard road without rails. More... Blackman Brothers (designers) - Mukilteo, Washington - Built by the North Pacific Iron Works of Seattle in August, 1881. Patented in August, 1883. Only one was produced. William Gage (owner) - near Mt. Vernon, Washington - The locomotive was successfully used on Mr. Gage's broad gauge logging railroad, the rails of which consisted of 3" X 5" maple wood rails. The locomotive weighed 3 tons and developed ten horsepower. Source - "Logging Railroads in Skagit County" - photo - Walt Taubeneck and Marysville Historical Society. William Crippen operated a machine shop and foundry in Clam Lake, Michigan (later part of Cadillac). 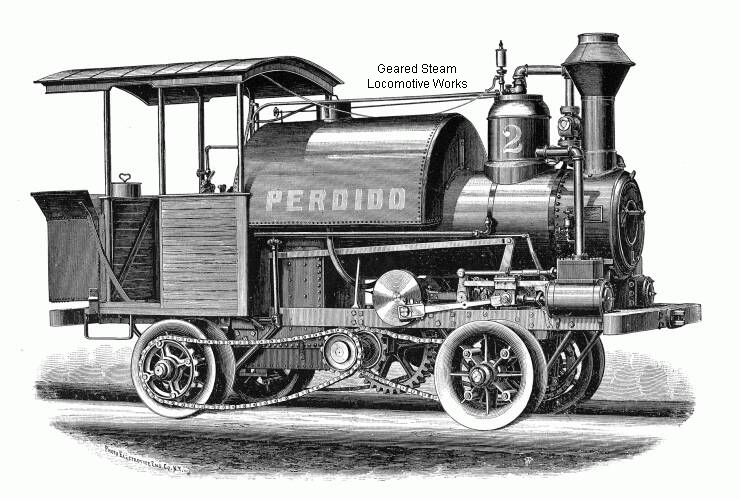 In addition to assisting Ephraim Shay in constructing his first locomotives, Crippen went on to patent and build a single geared steam locomotive of his own unique design (pictured). Click here for more information. 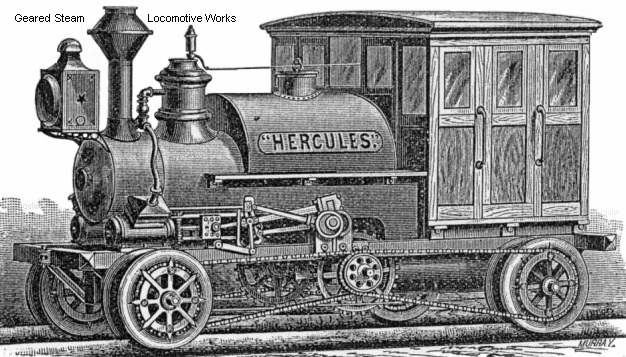 Image from the Michael Koch collection as published in "Articulated Steam Locomotives of North America - Vol #1"
Upper - Drawing of typical Curtis. - Source: "Logging Locomotive For Wooden Track" appearing in the January 23, 1897 issue of Scientific American. Lower - Owner Unknown - Source: "Logging Locomotive" appearing on page 417 of the June, 1897 issue of Locomotive Engineering. Concave wheels for pole or wood road operation.